For the last few months, my Wednesday evenings have been in a committed relationship with the incredibly addicting new ABC show Revenge. Now that Season 1 is over, I’m suffering severe Hamptons-drama withdrawal, and I’m guessing a lot of you are, too! Hopefully, a fashion inspiration article will help to fill that void until Revenge returns in the fall. I’ll admit that I had misgivings about Revenge at first: when the first promotional ads for the show appeared, I was utterly convinced that it would be awful. (In my defense, the early promos were pretty cheesy.) Even the fact that it was supposedly inspired by The Count of Monte Cristo, one of my favorite books, and starred Ashley Madekwe, whom I loved in Secret Diary of a Call Girl, wasn’t enough to entice me. Eventually, though, I caved and watched the pilot. And by the end of those scintillating 45 minutes, I was newly obsessed, with a passion that almost rivaled Emily’s fixation on retribution and Victoria’s love for bandage dresses. Almost. Revenge is a show all about, you guessed it….revenge! Heiress Emily Thorne has recently moved to the Hamptons, where she befriends other fabulously wealthy folk like Conrad and Victoria Grayson. But there’s more to this pretty socialite than meets the eye. Emily Thorne’s real name is Amanda Clark. As a child, she lived a life of privilege in the Hamptons with her loving father, who worked for the Graysons. However, he was betrayed by the Grayson Corporation and falsely imprisoned for a crime he didn’t commit. 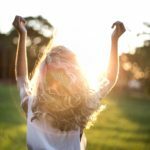 His incarceration and subsequent death in prison turned her life upside down. Now, not only has Emily/Amanda come into her inheritance, she’s also discovered that her father was actually innocent. She’s finally come back home…and she’s willing to do whatever it takes to avenge her father. Emily’s ultimate goal is to destroy the Graysons. She finds her opportunity in Daniel Grayson, the handsome but naive heir to Grayson Corporation. They say revenge is a dish best served cold…but just about everyone on this show has got smokin’ hot style. 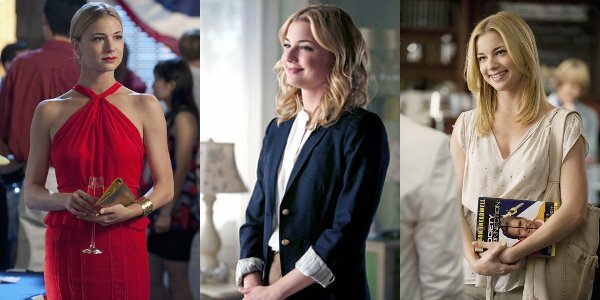 Get dressed with a vengeance with these outfits inspired by the characters of Revenge! Emily Thorne, played by Emily Van Camp, lives for one thing and one thing only: revenge. Behind her calm demeanor and perfectly tousled blonde locks is a seething storm of scheming and hatred for those who wronged her father. But despite her one-minded determination to use Daniel Grayson to achieve vengeance, she has a soft side, too, and can’t help but develop feelings for Jack Porter, a childhood friend. When it comes to clothing, Emily embodies classic Americana: She favors clean lines and classic silhouettes. She opts for elegant, timeless pieces that are imbued with just enough modernness to keep the look fresh. On the show, Emily has worn clothing from designers such as Jason Wu, Zac Posen, Stella McCartney, and Gucci. Snag Emily’s style with tailored basics like a navy blazer and crisp white jeans. Balance them out with more organic items like a laser-cut top and a delicate infinity bracelet. Finally, tie the look together with eye-catching red wedges and sparkly stud earrings. 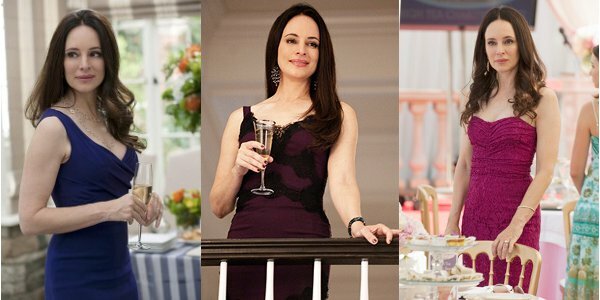 Victoria Grayson, played by Madeleine Stowe, is the unofficial “Queen of the Hamptons,” the ice queen who seems like she’s got it all. Naturally, everyone both fears her and wants to be best friends with her. Victoria has ascended to a seat of power and she’s determined to stay there. Her only “weakness” is her devotion to her firstborn, Daniel, for whom she is willing to sacrifice just about anything. Victoria might be the matriarch of the Grayson family, but her fashion sense is far from matronly! In nearly every episode, she shows off her dangerous curves in attention-grabbing dresses from labels like Herve Leger, Dior, and Dolce & Gabbana. Essentially, Victoria Grayson style = bandage dresses. While $1,000+ Herve Leger frocks are out of most college girls’ budgets, the dresses below will give you the Herve look on a budget. Then just add your blingiest earrings, a tennis bracelet (real if you’ve got it, CZ if you haven’t…no one will be able to tell! ), and a knockout pair of stilettos for a chic but sultry look that’s ideal for a formal get-together or a fancy dinner date. Ashley Davenport, played by Ashley Madekwe, is Victoria’s event planner. Surrounded by the highest echelons of society, she’s all too aware of the limitations imposed upon her by her lower-class background. 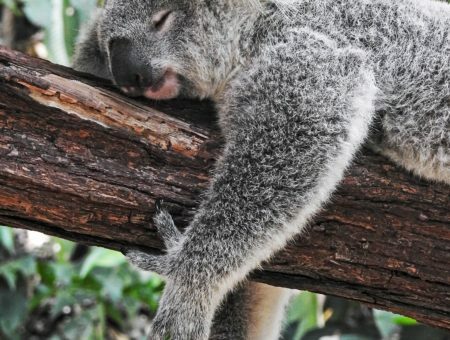 As such, she’s highly ambitious and eager to climb the social ranks, even if she has to step on others on the way. While Ashley might not be as wealthy as the other characters, if you ask me, she’s definitely the best dressed! Unlike Emily and Victoria, she eschews overly classic pieces: Ashley’s all about the latest and greatest in fashion. (No surprise there: Uber-stylish Madekwe and her character have similar tastes.) 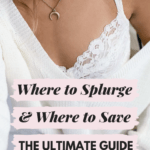 She favors relatively affordable high-street brands like Topshop and BCBG. Get Ashley’s edgy but feminine look with a red sleeveless blouse and pleated leather skirt. Add eye-catching details like stud earrings, chain bracelet, and sky-high wedges to make the outfit stand out. Finally, embrace a big 2012 trend with a cool neon clutch. Charlotte Grayson, played by Christa Allen, is the youngest Grayson. A quintessential “poor little rich girl,” she’s grown up sheltered and somewhat spoiled. Although Charlotte and her brother Daniel are very close, she has a rocky relationship with her mother, who she feels is overly controlling. When we first meet Charlotte, she’s a carefree teenager who just wants to find summer love. 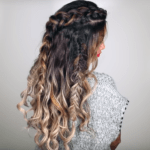 Her style is young and girly, featuring designers like Rebecca Taylor and brands like Forever 21. Charlotte’s look is easy to imitate with a floral romper and summery wedges. Add some feminine flair with a ruffle bikini and a metallic bow belt. Slip on mint green sunglasses and swipe on berry lip stain for a perfect summer beach look! Nolan Ross, played by Gabriel Mann, is Emily’s partner in crime; he’s the one who came to her with the revelation that her father was innocent. A technology prodigy and self-made billionaire, Nolan can sometimes appear hapless and bumbling, but he proves to be a reliable and surprisingly resourceful ally. 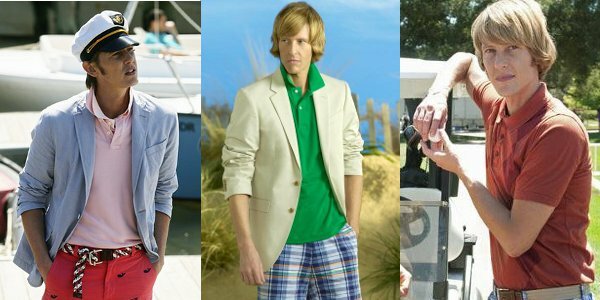 If you’ve ever wanted to summer at the Vineyard or go sailing on the Cape, you’ll love Nolan’s super-preppy style! (Seriously, I bet the guy’s got whale-print pajamas.) Get his put-together look without looking like you’ve stepped out of a ’90s J. Crew catalog with an updated prepster ensemble. White blazers are super-popular this season, so slip one on over a classic navy polo and coral (another hot spring color!) shorts. Inject some nautical details with anchor earrings, crocheted boat shoes, and striped beach tote. Finally, paint on a coat of canary yellow polish for a touch of pizzazz.